A stellar set for a stellar price! 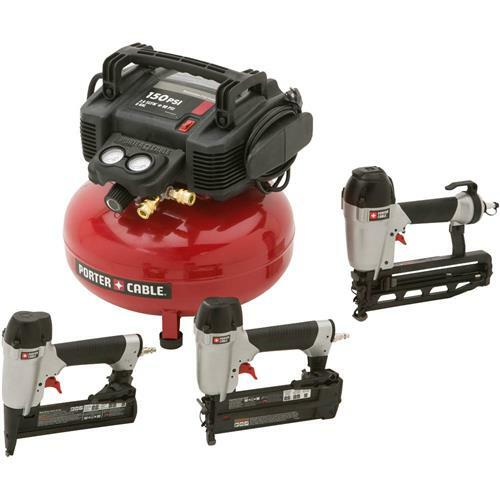 This set includes three nailers: FN250SB 16ga 2-1/2" finish nailer; BN200SB 18ga 2" brad nailer; TS056 heavy duty 3/8" stapler, as well as a 6 gallon, 150 PSI compressor that weighs only 30 lbs. for portability and power. 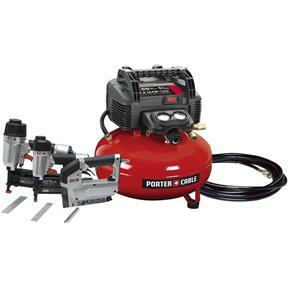 The compressor runs 2.6SCFM at 90 psi, has a maintenance-free pump, and uses a 120V electric unit which allows the user to run it on a standard household current. The 150 psi also allows you to drive more nails per charge than the standard 135 psi compressors. All nailers and staplers have long life, maintenance free motors, tool free depth of drive adjustment with detents for proper setting of nail heads, and tool free jam release mechanism for easy nail removal. 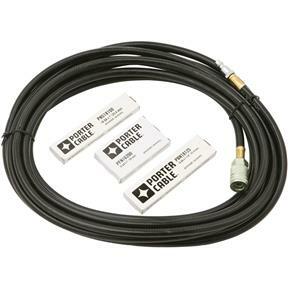 Combo Kit also includes 25ft of 1/4" air hose with a coupler and plug, 100 quantity of 16ga 2” finish nails, 100 quantity of 18ga 1-1/4” brad nails, and 84 quantity of 3/8” crown staples.